Training is a very important part of raising a puppy, although it's never late to train an adult dog. When a dog understands and obeys at least a few basic commands, it is much easier to control its behaviour, to maintain your pack leader position, and even to save your dog from life threatening situations. Here's a list of the basic dog commands every dog should know. Training sessions should not exceed 10-15 minutes each. Training sessions should be repeated 2-3 times a day. It's recommended to start training inside the house so there are less distractors. Practice one command at a time, do not confuse your dog by teaching several commands during the same training session. Once your dog learns the command perfectly, you no longer need to give it a treat every time. You can start doing it occasionally, but please remember it's always a good idea to praise and reward. Most of these exercises require the dog to know its name and respond to it. Every time your dog succeeds, don't fall into over-excitement and don't let your dog become over-excited, either. If your dog cannot focus on the exercise because it's over-excited, let it calm down first. It might be a good idea to exercise the dog before you proceed so it burns off its surplus energy. This is probably the first command you'd want to begin with. It's easy, and it plays an important role in reinforcing your pack leader role and managing unwanted behaviour. You will need a handful of your dog's favourite treats for this exercise. Get your dog's attention by saying his or her name, and show it you have a treat in your hand. Hold the treat just above the dog's nose, but not too high so the dog is not tempted to jump. Repeat your dog's name followed by the "sit" command said in a clear, firm, and confident voice. Move the treat back towards your dog's ears. As soon as your dog's rear lands on the floor, say "good sit" in an encouraging tone. Give your dog the treat and praise him or her profusely. Repeat the exercise 5-6 times. While it may be tempting, it's not recommended to push the dog into a sitting position if it doesn't sit after a few times. This may add negative experience to the training process, which should never happen. Instead, keep watching your dog until it sits naturally. When it does, say "good sit", and reward it. Dogs tend to sit naturally, so your goal is to link this action to the "sit" command. You may want to include the food bowl and the front door locations as regular training locations in order to encourage your dog to sit before feeding time and when greeting visitors. This is also quite an easy and useful command. The training exercise is pretty much similar to teaching the "sit" command. Get your dog's attention by saying his or her name, and show it you have a treat in your hand. Hold the treat in front of the dog's nose. Repeat your dog's name followed by the "down" command said in a clear, firm, and confident voice. Move the treat down toward the floor, slowly. When your dog's hocks and elbows are on the floor, say "good down" in an encouraging tone. Give your dog the treat and praise him or her profusely. Repeat the exercise 5-6 times. As well as with the "sit" command, avoid pushing the dog down if it doesn't lie after a few tries. Instead, keep watching the dog until it lies down naturally, and say "down" when it does. Then reward the dog. This is a very important basic command that can help protect your dog from dangerous situations by calling it to you. The dog should be on the leash for this exercise. Start at the end of the leash. When the dog is not paying a lot of attention to you, say his or her name followed by the "come" command a clear, firm, and confident voice. Tap on your knees and step backwards, or make other movements you like to encourage the dog to come to you. If it doesn't come, you may tug on the leash slightly. As soon as your dog comes to you, praise it profusely. Make it clear that coming to you is a positive thing. Repeat the exercise 5-6 times. As your dog progresses, you may want to start practise this command without the leash. NOTE: if you do it outdoors, make sure your yard has a secure fence lest your dog escapes. There a few important things to remember about the "come" command. First of all, rewarding with treats can be tricky because if you call your dog in an emergency situation and it sees you have no treats, it may not come to you next time. It's advised that you use praise instead of treats. Secondly, the "come" command must never be used to call your dog for negative things such as punishment, baths (until your dog enjoys them), taking pills and so on. You should be the one to come to your dog in these situations. Do not use the "come" command in an angry voice, either. If your dog tries to run away from you, do not run after it – this will be understood as a game, and it will also undermine your leading position. Try turning the situation around by calling the dog's name and running away from it. He may then run after you in play. If it happens, say "good come" and reward the dog with praise. If it doesn't happen, ignore the dog for a while so it calms down before you proceed with the exercise. The "stay" command is also very important. It can prevent your dog from getting into dangerous situations. A successful "stay" is when your dog does not make a single move from the original position. You can start with 1-2 second periods of staying and gradually build it up to several minutes. The dog should be on a leash for this exercise. Tell your dog to "sit" (the instructions on how to train your dog to "sit" are above). When your dog is sitting, praise it and give it a treat, but keep it sitting. Say your dog's name followed by "stay" in a firm, clear, and confident voice. At the same time, hold one hand up, palm out (as if to motion stop) for 1-2 seconds. Say "good stay" in an encouraging tone and give your dog a treat. Release your dog from the command by saying "okay" and encouraging it to move. Command you dog to "sit" again and praise it when it obeys. 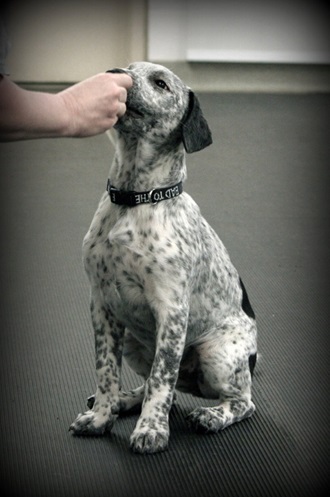 Command the dog to "stay" with the hand motion and take a few steps back over 2-3 seconds. If the dog stays, say "good stay" and give it a treat. If it moves, start the exercise all over again. Release your dog from the command by saying "okay" and encouraging it to move. Repeat this exercise 5-6 times, gradually increasing the time between "stay" and "okay". When your dog understands the idea of "stay", you can try leaving the room after you've given this command. Once your dog has mastered it, try practising the command with distractors. Ask a friend to talk or squeak a toy. Your dog should not move in spite of the distractions. When you try this command without the least, always make sure you are in a secure yard/area where you dog cannot escape.